Organized at Camp William Penn, Philadelphia, Pa., September 22 to December 4, 1863. Left Philadelphia for Hilton Head, S.C., January 16, 1864. Attached to Howell's Brigade, District of Hilton Head, S. C,, Dept. of the South, to February, 1864. Hawley's Brigade, Seymour's Division, District of Florida, Dept. of the South, to April, 1864. District of Florida, Dept. of the South, to August, 1864. 1st Brigade, 3rd Division, 10th Corps, Army of the James, Dept. of Virginia and North Carolina, to December, 1864. 2nd Brigade, 2nd Division, 25th Corps, to April, 1865. 1st Brigade, 2nd Division, 25th Corps, and Dept. of Texas, to November, 1865. SERVICE.--Expedition from Hilton Head, S.C., to Jacksonville, Fla., February 5-6, 1864. Occupation of Jacksonville February 7. Advance into Florida February 8-20. Camp Finnegan February 8. Battle of Olustee February 20. Retreat to Jacksonville and duty there until April. Moved to St. John's Bluff April 17. and duty there until August. Raid on Baldwin July 23-28. Moved to Deep Bottom, Va., August 4-12. Action at Deep Bottom August 12. Duty at Deep Bottom and in trenches before Petersburg until September 27. Battle of Chaffin's Farm, New Market Heights, September 28-30. Fort Harrison September 29. Darbytown Road October 13. Battle of Fair Oaks October 27-28. In trenches before Richmond until March 27, 1865. Appomattox Campaign March 28-April 9. Hatcher's Run March 29-31. Fall of Petersburg April 2. Pursuit of Lee April 3-9. Appomattox Court House April 9. Surrender of Lee and his army. Moved to Petersburg April 11, and duty there until May 24. Sailed from City Point for Texas May 24. Duty at Ringgold Barracks and on the Rio Grande, Texas, until November, 1865. Mustered out November 10, 1865. Moved to Philadelphia, Pa., November 10-December 3. Discharged December 12, 1865. Colonel Fribley had served as Captain in the Eighty-fourth Pennsylvania, Lieutenant Colonel Bartram in the Seventieth New York, and Major Burritt in the Fifty-sixth Pennsylvania. The camp was under the command of Lieutenant Colonel Louis Wagner of the Eighty-eighth, and as two other Pennsylvania Colored regiments had been formed here, the routine of duty was well established. In December, Major Burritt, with three companies A, F, and D, proceeded to the State of Delaware, for the purpose of obtaining recruits. At Wilmington and Seaford, these troops were handsomely received by the citizens, and a number of recruits were obtained. On the 16th of January, 1864, the regiment left camp, and proceeding to New York, embarked upon two transports, the Prometheus and the City of Bath, bound for Hilton Head, to which point the command had been ordered. The City of Bath made a speedy passage, but the Prometheus was tossed about by adverse weather, and was compelled to put in at Fortress Monroe, delaying its arrival at its destination for two days. The regiment was assigned to Howell's Brigade of Seymour's Division. On the 4th of February, the division was reviewed by General Gilmore, in command of the Department, the regiment eliciting much commendation by its good soldierly appearance. On the 5th of February, the regiment, in conjunction with a force of about seven thousand men, all under command of General Truman Seymour, embarked for a campaign in Florida, and on the evening of the 7th, landed at Jacksonville, on the St. John's River. At sunset on the following day, the march began. Eight miles out, the advance came upon an encampment of rebels from which they had just fled, abandoning, in their haste, a quantity of stores and several pieces of artillery. Early on the following morning, three companies of the Eighth, under command of Captain Wagner, made a descent on Finnegan's Depot, on the Tallahassee Railroad, capturing a quantity of stores, and one prisoner. For a short time, the regiment was detached from the brigade, and placed on duty guarding and repairing railroad bridges, and was successively stationed at Finnegan's, Picket House, Baldwin, and Barbour's. On the 19th of February, a change in organization was made, whereby the Seventh Connecticut, the Seventh New Hampshire, and Eighth Colored, were united in a brigade, to the command of which Colonel Hawley, of the Seventh Connecticut, was assigned. The enemy was known to be posted at Lake City, under General Finnegan, and against this post General Seymour determined to lead so much of his force as could be spared from garrison duty in his rear. Finnegan, discovering a disposition of the Union commander to advance upon him, determined not to await an attack at Lake City, but to advance some fifteen miles to meet it at a point near Olustee, where he took a strong position, with his forces formed on a swamp extending southward from Ocean Pond, his centre protected by the swamp, his right resting on an earth-work shielded by rifle-pits, and his left posted on a slight elevation, sheltered by pines, and guarded by cavalry. Unaware of this advance and new disposition of the enemy's troops, Seymour, who was at Barbour's early on the morning of the 20th, began to move. A march of a few hours, brought the column to Sanderson's, a distance of twelve miles. After a brief rest, the march was resumed, and at two P. M., a body of the enemy's cavalry was encountered, which quickly gave way. The artillery moved upon the road, and was flanked upon either side by a column of infantry. When nearing Olustee, and while proceeding quietly along without any expectation of meeting the foe, the head of the column was suddenly fired into by the enemy, from his strong lines in his well chosen position. The cavalry, and the Seventh Connecticut, which was armed with Spencer rifles, were thrown forward as skirmishers, but soon found that they could make little impression. Hawley's Brigade was in advance, Barton's and Montgomery's following at short intervals. Hamilton's Battery was quickly brought into position, but in that dead level could get no commanding ground. 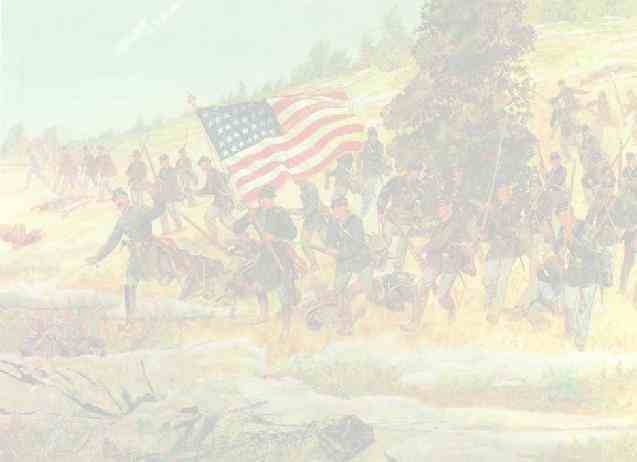 Without awaiting the arrival of the rest of his force, Seymour put the Seventh New Hampshire in position on the right of the road, and the Eighth Colored upon the left, and pushed them at once into action. The Eighth, though scarcely a month from camp, and with hardly any skill in handling a musket, boldly advanced in face of a withering fire from the enemy's strong and well chosen lines. Hamilton's guns thundered in its rear, adding to the terrors, and in some instances to the dangers of its position; but still it stood firm. For three-quarters of an hour, the action raged with unabated fury, these raw troops maintaining their ground without the least shelter, with a courage worthy of veterans. Several color-bearers were shot down, and many officers fell; but it preserved an unflinching front. At this juncture, the enemy, whose lines greatly overreached the Union front, charged upon the unprotected left flank of the Eighth, threatening its capture. Seeing that the ground could be no longer held, General Seymour ordered the regiment to retire. It was executed in good order, the men firing heavily as they went. Barton's and Montgomery's brigades rapidly came up and took the places of the troops withdrawn, and were in a similar manner beaten in detail, Seymour being finally compelled to retire rapidly, with a loss of a part of his artillery. The loss in the Eighth was very severe. Two officers and forty-nine men were killed, nine officers and one hundred and eighty men were wounded, and sixty three missing, all of whom, it was subsequently ascertained, were wounded and left on the field. Colonel Fribley and Lieutenant Thomas J. Goldsborough were killed; Major Burritt, Captain Wagner, and Lieutenants Seth Lewis and George Warrington, were among the officers wounded. The color company went into action with forty-eight enlisted men, and lost in killed and wounded all but six. The retreat was continued to Barbour's, the point from which the command had advanced in the morning, arriving at a little after midnight, having in the meantime, marched forty miles, and fought a severe battle. After a few hours rest, the retreat was renewed, and continued to Jacksonville, where breastworks were thrown up, and preparations made for holding the place, the enemy having followed closely, and threatening an attack. On the 17th of April, the Eighth, now under command of Captain Bailey, was ordered to St. John's Bluff, and was set to fortifying that point, and guarding the stream to prevent the enemy from planting torpedoes. In June, Major Mayer, of the Seventh Colored, was temporarily assigned to the command of the regiment, and under him, participated in numerous raids into the surrounding country, destroying a portion of the Cedar Keys Railroad, and taking some of the enemy's ammunition. On the 4th of August, General William Birney's Brigade, to which the Eighth now belonged, was ordered to Virginia, and joined General Butler's forces at Deep Bottom on the 12th. As the regiment went into position, the enemy opened upon it from his heavy guns at Fort Darling, wounding eight or ten men. On the 25th, it crossed the James, and went into position upon the Petersburg front, where it was kept on active duty. On the 9th of September, Major Burritt, who was still suffering from the wound received at Olustee, returned and assumed command, and was promoted to Lieutenant Colonel, in place of Lieutenant Colonel Bartram, who had been chosen Colonel of the Twentieth Colored, Major Mayer returning to his place in the Seventh, and Captain Wagner being promoted to Major. After a few weeks' duty, Colonel Burritt's wound again opening, he was sent to the hospital, and was subsequently, by order of the War Department, put in command of the recruiting rendezvous at Newport News, the command devolving on Major Wagner. Towards the close of September, the Tenth Corps, to which the regiment belonged, crossed the James, and in connection with the Eighteenth Corps, advanced upon the enemy's works at Chapin's Farm, and the New Market Road. An attack was made early on the morning of the 29th, by the Eighteenth Corps, supported by the Tenth, and a long line of works was carried, and sixteen pieces of artillery and three hundred and fifty prisoners were captured. On the afternoon of this day, General Birney determined to carry a bastioned fort in his front, and selected for the desperate work, a brigade consisting of the Seventh, Eighth, and Ninth Colored. The Ninth was first led to the charge, and after a resolute movement was forced to retire, having suffered severely. The Eighth was next put in. It numbered only about two hundred men; but deploying eight companies as skirmishers, Major Wagner promptly moved to the assault, and gained a position within one hundred yards of the enemy's works, where the men commenced pouring in a steady fire, effectually driving the rebel gunners from their pieces. For several hours, and until the troops on its left were withdrawn, this position was held, the regiment not being in sufficient strength to carry the fort. Seeing the flank of the regiment exposed, the enemy immediately charged; but Major Wagner delivered a counter charge, breaking the hostile line, and thus saving his entire regiment from capture. At dark, it was relieved, and with the division fell back to the line of works captured in the morning. The loss in this engagement was twelve killed and sixty-one wounded. Captains Cooper and Richardson, and Lieutenants Seth Lewis and Charles C. Cone, were among the severely wounded, the latter mortally. On the following day, while the troops were busy reversing the breast-works, the enemy attacked. The Eighth was hurried to the threatened point. and assisted in repulsing the enemy, sustaining some loss. On the morning of the 13th of October, the division was ordered out for an offensive movement. The Eighth was put upon the front as skirmishers, and led on through a dense wood, on the Darbytown Road. The enemy's skirmishers were encountered, and after sharp fighting were driven from three successive lines where they had taken shelter back to their main line. Late in the afternoon, the regiment was relieved by fresh troops. It entered the engagement with one hundred and fifty men, and lost seven killed, thirty wounded and one missing. Captains Alexander G. Dickey, Elijah Lewis, and Electus A. Pratt, were among the severely wounded, Captain Dickey mortally, and Captain Pratt with the loss of an arm. At the beginning of November, Major Wagner was promoted to Lieutenant Colonel of the Ninth Regiment, and Lieutenant Colonel Burritt, owing to his wounds, being still unfit for duty in the field, Lieutenant Colonel Samuel C. Armstrong, of the Ninth, was placed in command of the Eighth, and promoted to Colonel. Soon afterwards, a number of recruits were sent to it from Camp William Penn, largely increasing its strength. When the spring campaign opened, the regiment crossed the James, and participated in the operations which resulted in the fall of Petersburg, and was among the foremost to enter the city. Soon after the surrender of Lee, it returned to Petersburg, and thence proceeded by sea to Texas. Upon its arrival there, it was stationed at Ringgold Barracks, on the Rio Grande, and beyond the usual camp duty, and an occasional expedition to settle Indian troubles, was little employed. The Mexican (Liberal) troops were quartered, on the opposite side of the river, and between the officers of the two encampments, an intimacy sprang up, which resulted in a free interchange of social hospitalities. On the 10th of October, the regiment started on the homeward march, and proceeding via Santiago, New Orleans, and New York, arrived at Philadelphia on the 3d of December, and on the 12th, was mustered out of service. It is worthy of note, that of all the colored regiments in the United States service, this one, as shown by the official army register, lost in battle, more officers and men than any other.